Ewan Gunter weaves about for Gala in their ill-fated encounter with Stewart's Melville (picture by Alwyn Johnston). Two from the top four in BT National League Division One face each other this weekend as Jed-Forest host Gala in a very attractive clash. 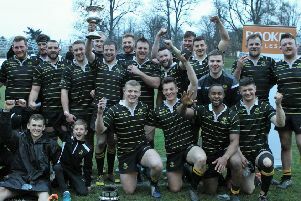 Jed have captain Gregor Young back in the squad after injury and enjoyed a big victory at Falkirk last Saturday, racking up 10 tries in the process. Gala, meanwhile, went down to their third straight league defeat, having won their opening six fixtures – and Saturday’s loss was particularly maddening, as they saw a 24-0 lead evaporate against Stewart’s Melville FP. Director of rugby at Riverside Park, Ali Campbell, said Jed were really looking forward to it. “You can’t beat a local derby against Gala, and I think with them coming down from the Premiership, they will provide a really big, stiff test,” he said. Campbell added: “I don’t think we started the season particularly well – we’re on a slow burner, instead of starting with a bang like in previous seasons. We’re getting better every week but we are still leaking tries, and that is a worry for us. Gala skipper Graham Speirs said the Maroons were still at the right end of the table and looking forward to the game. “Both teams like to throw the ball around a bit and there’s a fair bit at stake for both sides,” he said. Speirs said the 31-24 loss on Saturday had been “a tough one to take” after such a good start. There was a rare physicality in defence by Gala in the first half but they were too soft defensively in the second and possibly switched off. “It was certainly a mindset thing with us, as opposed to an ability thing,” he said – adding Stewart’s Melville deserved credit for buying into the clear shift in their game plan. Going into their next couple of games as underdogs may suit Gala, he added.